This is the last leg of the 870 mile Wales Coast Path. It starts at Mumbles/Swansea ending at Chepstow on the Wales and England border. A 118 mile (190 km) long section, and an easy to moderate trail. 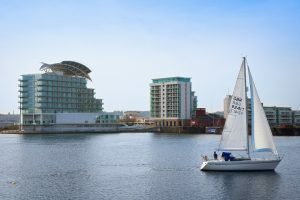 The South Wales coastline takes in the city landscapes of Swansea, Cardiff (Wales’ capital city) and Newport, quiet villages like Monksnash and Gileston, and major sand dune systems at Ogmore and Merthyr Mawr. 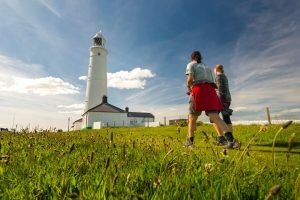 The path utilises the spectacular Glamorgan Heritage Coast with breathtaking views of the Severn Estuary looking across to Somerset and Bristol. The Severn Estuary has the second highest tidal range in the world at 49 feet and is home to the Severn bore. The Severn Bore is one of Britain’s few truly spectacular natural phenomena. The shape of the Severn estuary funnels the water into an increasingly narrow channel as the tide rises, thus forming the large wave. As the width of the river decreases rapidly, so does the depth. This forms a funnel shape and as the incoming tide travels up the estuary, this is how the surge wave or bore is formed. 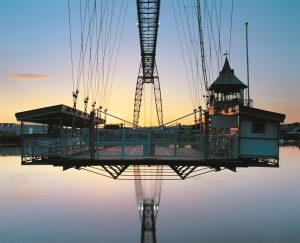 Savour the industrial and maritime history at the larger cities of Swansea, Cardiff and Newport. You have an option to take days off whenever it pleases you, so that you have time to visit the various museums such as The National Waterfront Museum at Swansea, The National Museum of Wales, The Wales Millennium Centre and the Senedd (National Assembly for Wales) at Cardiff and the Transporter Bridge at Newport. You will not be disappointed with the various wildfowl and waders than can be spotted along the way. Curlew and plover are common. The Severn estuary is one of a few estuaries in Britain to have more than 100,000 wading birds. The Gwent Levels, an area of reclaimed salt marsh, protected by sea defences is a haven for all kinds of birds. The coastal path goes right through the Newport Wetlands Nature Reserve (RSPB) which has an informative Visitors’ Centre and Café. Traditional beaches like Porthcawl and Barry Island and the Victorian Pier at Penarth are all on the trail. For the film and television buff, parts of Merthyr Mawr beach was a film set for “Lawrence of Arabia” whilst “Dr. 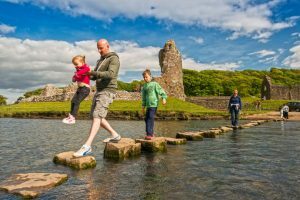 Who” (produced at nearby Cardiff) have utilised our natural beauty spots like Southerdown Beach, Coney Beach, Porthcawl and Merthyr Mawr Warren. And of course “Gavin and Stacey” is synonymous with Barry Island. This trail has something for everyone! And if you want more – the trail ends at Chepstow where you can start on another national trail, the Offa’s Dyke Path. All our packages include accommodation (bed and breakfast) in en-suite rooms, maps and route book, door to door luggage transfer, people transfer where necessary and our back up service. Our prices are based on 2 persons sharing a room. For solo walkers walking on their own, there will be an added charge of £35 per night. For those walking with others, but wanting a single occupancy, there will be a single supplement charge of from £20 per night. Rest days will be from £45.00 per person per night. Can't find the right gift? Why not buy your loved ones a gift to remember. 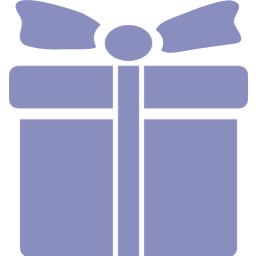 Our Gift Vouchers can be bought for any of our walking packages. 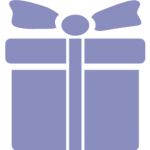 Vouchers can be bought in any denominations of £20, £50 and £100.